We’ll admit it: We like a little bit of everything. A balanced wardrobe needs a touch of nostalgia as much as it requires a few ultra-modern offerings. 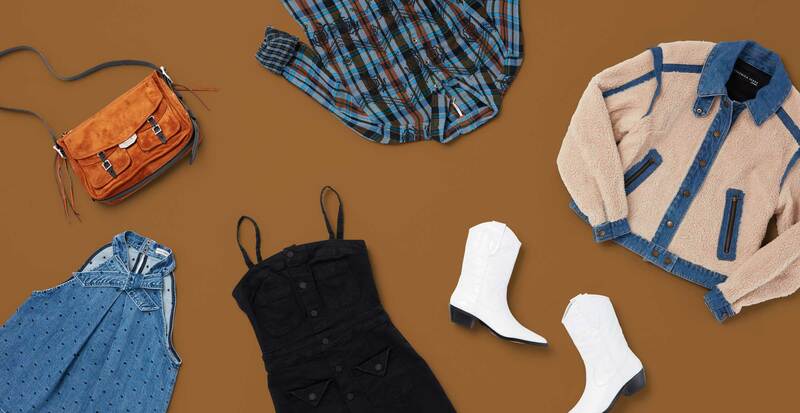 We've recently celebrated some of our favorite fall trends inspired by eras past (like retro sweaters and volume denim), but none are quite as unique as the Western-born aesthetic. Rugged jeans, silver hardware over suede, and a healthy dose of decorative topstitching are just a few of the ways you can capture this look. Make no mistake, however: This trend is worn with contemporary sensibility, having little to do with rodeo-ready attire. And while it completely lassoed global runways this past season, it is a trend with the potential to slip into costume territory. Our advice: Balance statement accents with neutral pieces. Opt for Western-inspired materials in contemporary silhouettes. And, when in doubt… go straight for the white leather cowboy boots. Ready to saddle up and ride this trend right through fall? 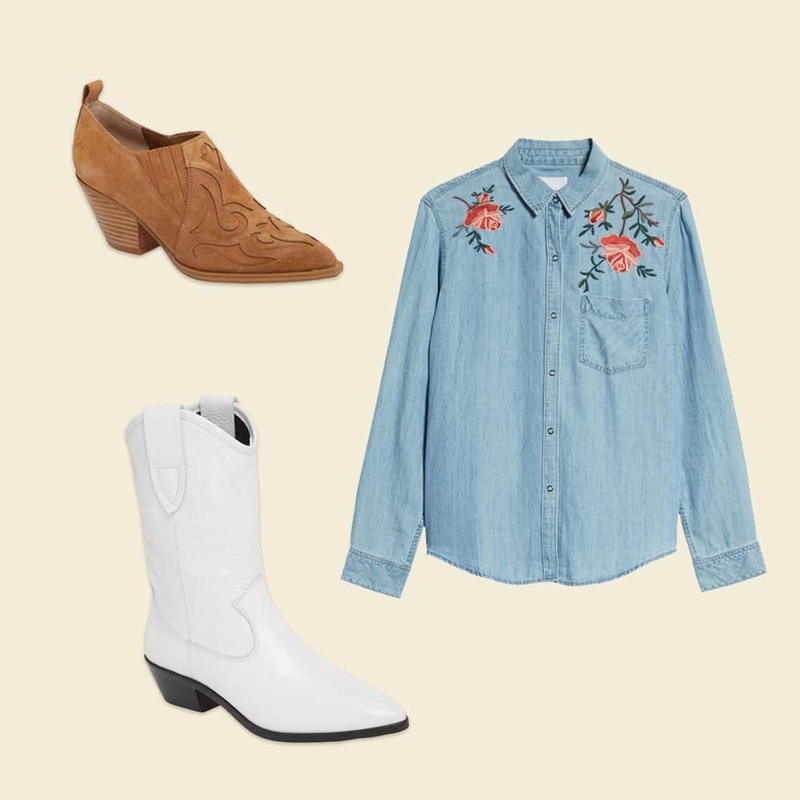 Discover four ways to wear the Western trend. 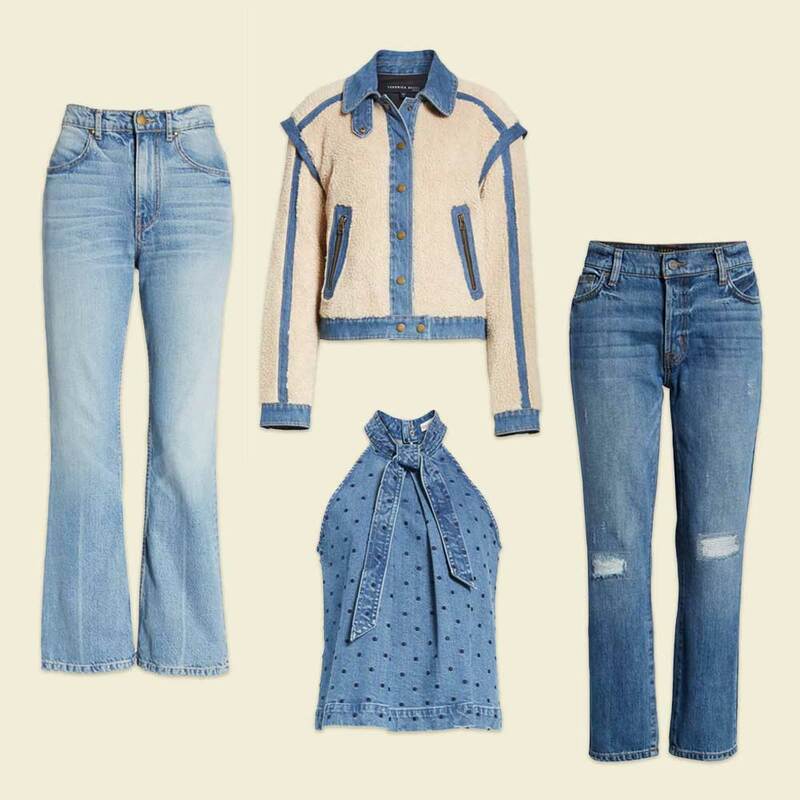 There’s no easier way to embrace your inner cowgirl than to suit up in some stylish denim. We’re huge fans of feminine silhouettes rendered in this rugged fabric, as well as vintage-wash jeans in a cropped style (the best way to show off your boots) with a bit of deconstruction at the knees. You can also achieve a casual-chic look by pulling on a jacket with a (super-warm) fleece and denim combination. Oversized hardware—especially of the belt buckle variety—is a playful hallmark of the Western trend. Take a subtle approach to this bold statement with a thin accent belt. You can also wear it on a wide-brimmed hat or an ankle boot. And don’t be shy! A few extra buckles on your shoes will seal the deal on this fun fall trend. Topstitching appears on everything from jeans and jackets to hats and belts, but you may be most familiar with this decorative design on cowboy boots. Statement stitching on any garment or accessory can offer a hint of the western sensibility. Try it out in an embroidered top or chic suede shoe. The Western trend is anything but tame (it’s called the Wild West, after all). Adopt your own animal magnetism with leather and reptile-rendered shoes and accessories. And animal lovers, fret not! Faux skin, and even accessories with animal motifs, create an equally stylish impact.